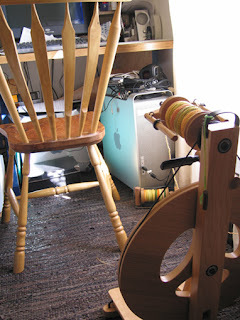 Spinning wheel and lazy kate as I left them Sunday afternoon when the oven timer pinged to say my afternoon was over. I didn’t even fill the bobbin! Note the chair pointing sternly, steadfastly toward work as it has all Monday morning. The results of my visit to the Knitting & Stitching Show at Alexandra Palace last Thursday. I prepared properly by assembling a train timetable, packing lunch, collecting phone numbers for people I’d be meeting. I was told in no uncertain terms to buy spinning fibre to use on the new wheel (he decided to order the Schacht but it hasn’t yet shipped), so I added this to the shopping list. I remembered to take the shopping list. I made a strong start: I was one of the first people at Habu, so was able to collect everything on my list. I admit it was a long list, but no UK store stocks that variety of their yarns. Then I went *straight* to Jamieson’s of Shetland for the Autumn Rose kit I’d been coveting since Eunny blogged about its creation. Then I just had time to gulp some water and buy 2 lengths of charcoal/bronze/grey silk top (sold for silk paper, but it will add interest to some charcoal alpaca fibre), some Finn fibre in three shades of grey for an icelandic shawl, and a length of beautiful blue merino/silk top from Fyberspates before it was time to meet TussahSilk at the Habu booth. Fortunately Takako was serving someone else (she’d said she wouldn’t allow me to buy any more) so I was able to add 500m of neutral bamboo laceweight and 2 cones of charcoal and rust silk-wrapped stainless steel (on sale!!) for a scarf I hadn’t planned. Doesn’t everyone wonder what it’s like to knit with steel? 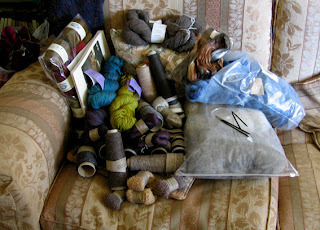 And that was the start of the long slippery slope down which I tumbled, becoming entangled with 2 skeins of laceweight qiviut and some Suzanne’s ebony circulars from Arnica apparently they became familiar with muskox and qiviut in Greenland. Look at her shawl designs; I was able to handle that Hyrna Herborgar, it’s wonderful and three skeins of Dream in Colour Smooshy from Socktopus. Two for gifts, one for me. Alice (the owner) was enjoying the show but a bit worried by the speed at which yarn was disappearing from her shelves. I hope everything worked out, she had a lovely smile! OK, that’s the confession. I still feel quite remarkably confused about the qiviut. I love it, I am desperately looking forward to knitting it, but I didn’t need it and it was relatively extraordinarily expensive. Spinning. Ah, spinning. I love my drop spindle. I love spinning silk. I discovered that spinning in public is easier than knitting. The train’s at your stop? Stuff everything in the bag and leave, you don’t have to worry about dropping stitches or markers, finishing rows, remembering precisely what was going on. Got 3 minutes to spare? Pull out the spindle and continue. I spun on the train (to the polite consternation of the male commuters, who watched whenever they thought I was looking the other way), I gave a basketmaker her first spinning lesson in the queue to enter the hall, I spent lunch teaching TussahSilk how to spin, I spun while she started to learn continental knitting at ‘Relax and knit’. I devoted Sunday afternoon to spinning. I want to finish the ‘Chain of Fools’ superwash. He’s been watching its progress with interest; on Sunday I asked whether he’d like a pair of socks that colour and the answer was a (for him) enthusiastic ‘yes’. I filled two bobbins with singles twisted a little more tightly than I wanted (for the plying) and then a little more tightly still (to compensate for quickly feeding the singles counterclockwise onto another bobbin to even the twist). Here are the bobbins on the Louet Victoria’s lazy kate with a loop of string to add more tension: the built-in tension on the lazy kate isn’t enough to stop the bobbins unreeling madly. This entry was posted in Uncategorized on October 15, 2007 by sarahw. So you DID go back and buy the quiviut, after all! Ooh, it was lovely, but the price was more than I could justify to myself. I think I have to KNOW what I’m going to knit with it for that kind of money.Thanks so much for doing Ally Pally with me, it really made my day. Erm, that is a HUMUNGOUS stash (makes my haul look quite paltry). That rucksack of your must be some kind of tardis! chain of fools looks awesome.remember that it WILL bloom when washed vigorously (as it should be washed) – I hope that knitting it is just as much fun! You fell down hard at Ally Pally! That’s my girl. Looks like a great way to go, too. By the way, you will thoroughly enjoy the resulting knits from Teyani’s yarn. I know I do. I’m so glad you didn’t hold back on the stash, knew you wouldn’t let me down! Maybe next year I’ll get there. The spinning looks wonderful, it will make a pair of lovely socks. Send some spinning mojo over here, I could do with some at the moment. So the price of the train ticket wasn’t wasted then?! What a fantastic hoard -well done you! Enjoy! 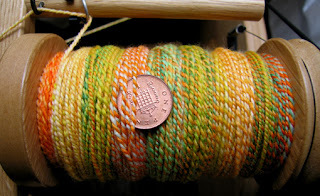 The spun yarn is awesome. I look forward to seeing what it knits up as. I envy your shopping prowess! I went to a fiber fest this weekend and didn’t buy a single thing! Must learn your secrets for choosing the must-haves.